Support for the Yunjia NRF51822 board. The NRF51822 module by Yunjia Technology is a minimalistic but very low- priced module utilizing Nordics NRF51822QFAA SoC. The SoC features 16Kb of RAM, 256Kb of flash ROM and comes on top of the usual micro-controller peripherals with a 2.4GHz radio that supports both Nordics proprietary ShockBurst as well as Bluetooth Low Energy (BLE). The board is available for example on ebay or at aliexpress for something around 8-10 USD. The Yunjia NRF51822 module comes without any on-board programming and flashing capabilities. It supports however to be programmed using of-the-shelf programmers as Segger's JLink or STM's STLink. 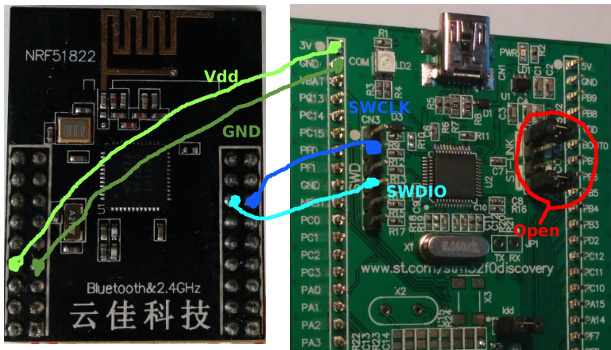 A very simple and affordable way to program and debug the Yunjia module is to the integrated ST-Link/V2 programmer of any STM32Fx-discovery board. The needed steps are described in the following sections. If you want to use a stand-alone ST-Link adapter, you just simply have to alter the wiring to fit for your programmer, the software part is identical. Second you need to enable the stand-alone ST-Link mode of the discovery board by removing the two CN2 jumpers, found somewhere in the upper right part of the board. This disconnects the ST-Link programmer from the micro-controller part of the port and enables direct access through the pin-header CN3, also labled SWD. Debugging and programming the Yunjia module works well with [[OpenOCD]]. We suggest to use a fairly recent version, best use the upstream version from their git repository. Version 0.9.0-dev-00148-g3a4ec66 is reported to work. 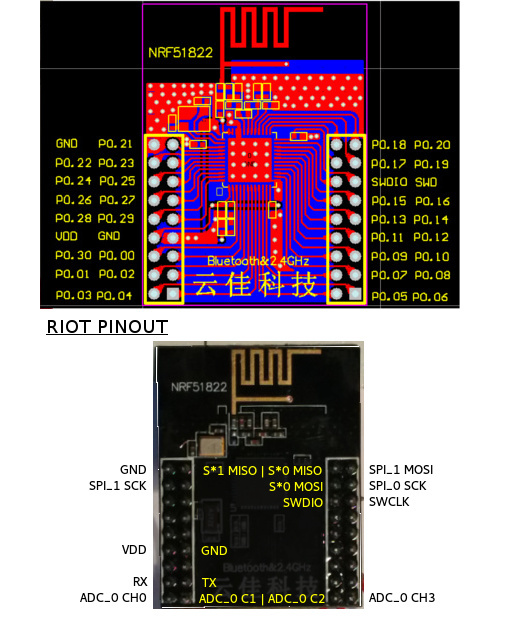 The UART pins are configured in boards/yunjia-nrf51822/include/periph_conf.h. The default values are PIN 1: UART_RX and Pin 2: UART_TX _(also compare schematic above)_. The BLE400 development board contains a CP2102 accessible through /dev/tty.SLAB_USBtoUART. You have to edit periph_conf.h to use it with UART_RX pin 11 and UART_TX pin 9. In one window, go to the RIOT root folder and run the regarding OpenOCD configuration script with: openocd -f boards/yunjia-nrf51822/dist/openocd.cfg. In the second terminal, connect to the device via telnet: telnet 127.0.0.1 4444. If you are successfully connected via telnet, first type halt and then nrf51 mass_erase. This should have erased the whole memory of the device. Board specific definitions for the Yunjia NRF51822 board. Peripheral MCU configuration for the Yunjia NRF51822 board.